Sketchy Science: Forcing a White Christmas: Can humans control the weather? Forcing a White Christmas: Can humans control the weather? 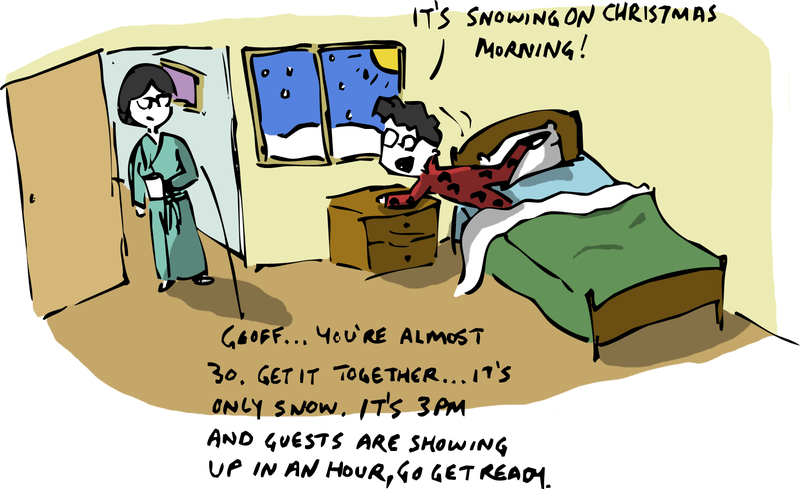 When I was a kid, I can distinctly remember going to bed on December 24 – on more than one occasion – feeling anxious that there would not be snow for Christmas. 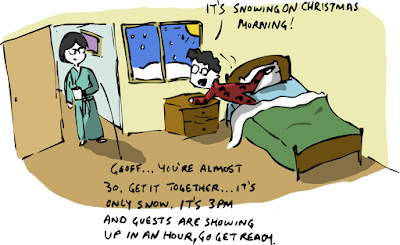 Ultimately, I ended up having pretty good luck and the majority of my Christmas mornings included a fresh layer of powder in the yard, even if the day before had been greener than a sack of unripe bananas. But what if we didn’t have to rely on luck? Can science guarantee white Christmases? 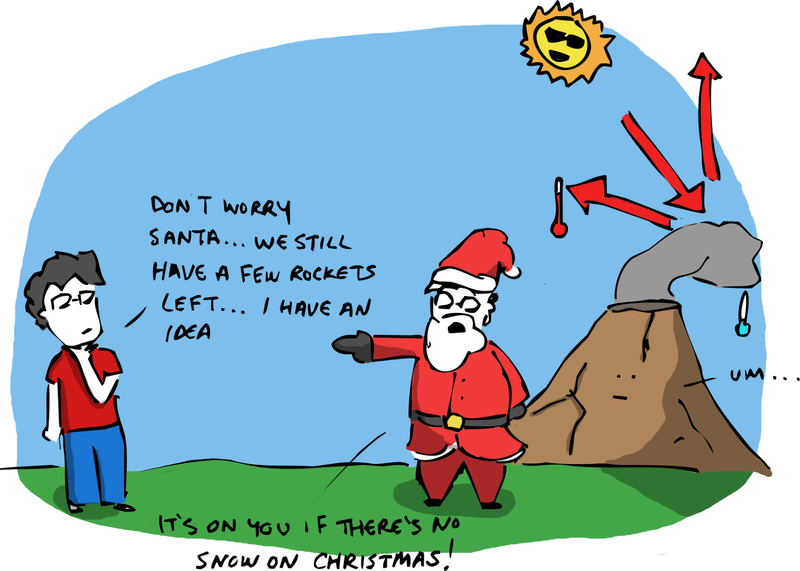 Setting aside the issue of whether or not we could get people on board with the idea (Santa is historically unprepared to do his work in blizzards, if TV specials are to be believed), the issue of whether it is technically possible to control the weather has piqued the interest of people for thousands of years. 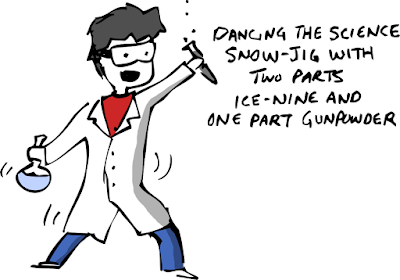 Countless cultures around the world have rain dances or other, mostly dubious, means of coaxing favourable meteorological conditions, and that urge has carried over into the labs of enterprising scientists as well. At the heart of the matter is building clouds. Whether you are looking for rain to water crops or just sleddable snow, clouds are where you have to start. 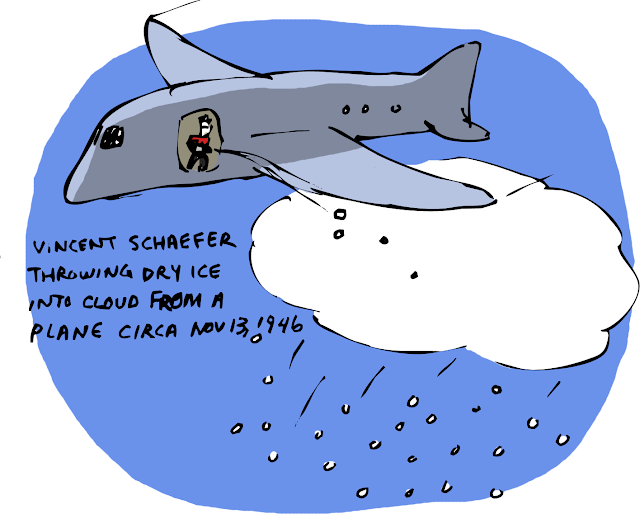 Fortunately, back in 1946, a couple of guys named Irving Langmuir and Vincent Schaefer were working at a General Electric research lab and discovered that if you tossed some dry ice into a super-cooled cloud, you could produce massive amounts of ice crystals in relatively short order. The key is finding a substance that can seed the formation of the precipitation you are looking for. It turns out that the hardest part about producing rain drops or snowflakes is getting them started. If you can find some material that water or ice can latch onto to give them a head start, you might be able to get the ball rolling. Note: the actual experiment took place in a cloud chamber, not an actual cloud. But where's the fun in that? Geoff's Side note: It totally happened. The materials that are used most often are silver iodide for ice crystals and very fine salt particles for water droplets, with the results varying depending on who you ask. The Chinese government is extremely confident about its ability to control the weather. So much so that officials in Beijing guaranteed clear skies for the opening ceremonies at the 2008 Olympics by encouraging rain in the lead up to the event (to essentially drain the atmosphere of moisture). Whether the 1,104 cloud seeding rockets they shot into the sky in the lead up to the event actually made a difference in the clear skies that ultimately came together can’t be known for certain, but there is some evidence to support it. An eight-year long research project conducted in Texas and Oklahoma suggested that cloud seeding increased rainfall, cloud height, length of storms, and the area in which rain fell. That said, the US government doesn’t kick in any money for states that want to address droughts by pumping chemicals into the sky. So if we can potentially make it rain, how do we turn that rain into snow? Even the ice crystals formed by seeding with silver iodide will fall as rain if the air temperature is too warm; climate change only adds to the problem. Fortunately there may be a solution for that too - the trick is in mimicking volcanoes. When a big volcano erupts, it throws a lot of material into the atmosphere and the effect can be significant cooling over a wide area. When Mount Pinatubo erupted in the Philippines in 1991, it led to around 0.5 degrees C of cooling in the Northern Hemisphere for up to 2 years afterwards. The bulk of the cooling is the result of sulphur compounds getting into the atmosphere. They operate like a zillion little mirrors and reflect sunlight away from the Earth. Scientists have suggested that pumping a relatively small amount of sulphur into the sky using planes or balloons for dispersal could have a similar effect. It wouldn’t be enough to stop climate change, but it might be enough to make the weather outside a little more frightful. 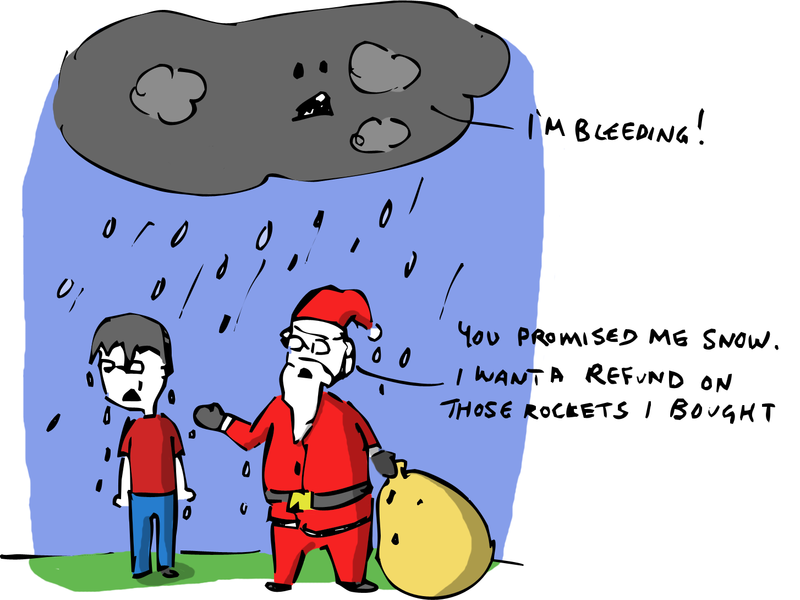 Obviously, there are ethical questions that go along with performing unchecked experiments on the weather and putting Santa at risk. Should humans play god with systems we don’t fully understand? I guess it depends on how good you are with a GT snow-racer. Your illustrations are so cool. Tweeted!